FILE - A migrant climbs the border fence before jumping into the U.S. in San Diego, California, from Tijuana, Mexico, Dec. 27, 2018. U.S. President Donald Trump contended Sunday that the damage from the country's "badly broken border" with Mexico is "far greater" than the effects of the longest-ever partial government shutdown, now in its 23rd day. "The building of the Wall on the Southern Border will bring down the crime rate throughout the entire Country!" Trump claimed on Twitter. 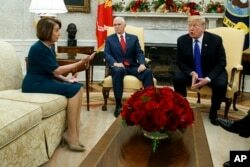 FILE - Vice President Mike Pence, center, looks on as House Minority Leader Rep. Nancy Pelosi, D-Calif., and President Donald Trump argue during a meeting in the Oval Office of the White House, Dec. 11, 2018, in Washington.